Not only has it prompted me to dump nearly 20 hours into Golf Story (for some thoughts on this intriguing indie, see this post) in the ensuing days and weeks, but it's also prompted me to dump about 10 hours into Super Mario Odyssey. I'd say that's more than enough time to form some solid opinions of the latter game, wouldn't you? Speaking of which, here are a few impressions of Super Mario Odyssey given what I've experienced of it so far. 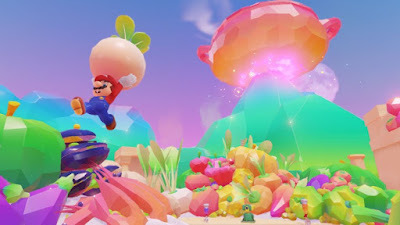 The Cappy-tossing mechanic is the best thing that's happened to the Mario series in some time--As the headline of The Guardian's Super Mario Odyssey review states, "controlling a sentient hat has never been so fun." Not only is it an absolute blast to simply throw Cappy here and there (in a way that's thrillingly reminiscent of tossing water bubbles in Mizubaku Daibouken), but it's even more satisfying to chuck him at an object or being to see if Mario can "possess" and control them. That said, I kind of wish some of Super Mario Odyssey's many costumes also acted as power-ups--There's no question Cappy is a cool addition to the long-running Mario series. Still, his presence isn't enough to keep me from missing the power-ups that populate previous games like Super Mario Galaxy and Super Mario 3D World. The same is true of Odyssey's plethora of collectible costumes. Changing Mario's look is nice and all, but it would be even nicer if at least some of them provided the mustachioed icon with a unique ability or two. Maybe that's what Nintendo will give us with Super Mario Odyssey 2? The different art styles offer a welcome change of scenery--If you ask me, too many modern Mario games look alike. That's especially true of the two-dimensional New Super Mario Bros. titles, of course, but I'd argue it's also true of the more recent three-dimensional efforts like Super Mario Galaxy and Super Mario 3D Land. Odyssey throws a wrench into the works by providing a handful of worlds (kingdoms, actually) that veer off in different directions, aesthetically speaking. 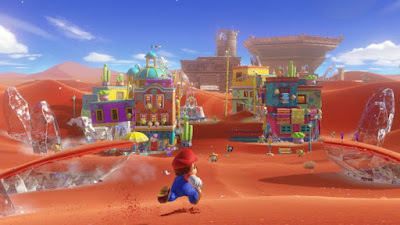 Personally, I would've preferred it if every kingdom sported a completely unique art style, but I also can understand why Nintendo's designers and developers thought that might be a bit too shocking for your average Mario fan. I don't understand why this game includes question mark blocks--In almost every Mario game I've played before this one, smashing a question mark block often causes a power-up to pop out. In Odyssey, the same action usually nets you a coin. If you're "lucky," you get a life-enhancing heart instead. Whoopdidoo, right? Granted, I still break (nearly) every question block I encounter, but I'm not sure I'll continue to do so as I edge closer to the game's end credits. The lack of in-game information regarding handheld-specific moves is frustrating--Even more frustrating: the lack of handheld-specific moves, period. 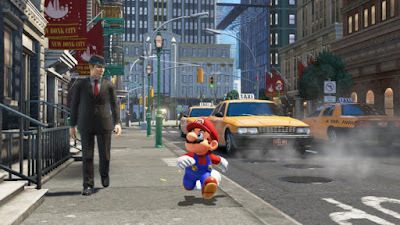 Although you can play Super Mario Odyssey with your Switch configured as a full-on handheld (as opposed to a TV-connected or tabletop console), doing so means you won't be able to pull off a number of Mario's many moves. That's beyond disappointing, in my opinion. To be sure, it hasn't kept me from completing at of the game's worlds, but I have a feeling it'll eventually keep me from grabbing some of its moons. Sure, many of the game's moons are basically handed to you, but that doesn't bother me--I've heard some folks say Super Mario Odyssey contains too many moons. (This title's version of Super Mario 64's and Super Mario Galaxy's stars.) I've also heard people complain that too many moons are easily acquired. I can't disagree with the latter, but I also can't say it bugs me all that much. Actually, I like that you can nab a good number of moons with very little effort. Not only does it make grabbing the tougher-to-reach moons all the more electrifying, but it allows beginners (or people who have a hard time with three-dimensional games) to feel like they're accomplishing something, too. I can't believe I'm saying this, but I kind of miss the 3DS' 3D capabilities here--I'm one of those weirdos who rarely uses the 3DS' 3D capabilities. In fact, the only time I can remember turning it on for more than a few minutes was when I traipsed through Super Mario 3D Land. Why'd I make an exception for that game? Because it made certain platforming sections a lot less frustrating. I'm pretty sure 3D functionality would prove similarly helpful while playing Super Mario Odyssey. Oh, well, you can't have everything. And, honestly, I don't wish the Switch had a 3D screen--even if it made leaps in Odyssey a little easier. 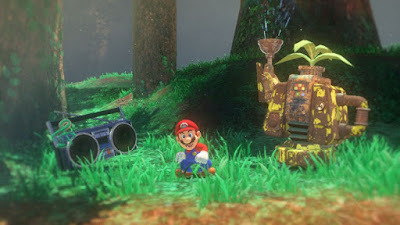 Super Mario Odyssey's inconsistent use of music is curious--And I don't necessarily mean curious in a bad way. Sometimes ambient noise is preferable to an annoyingly catchy jingle while playing an atmospheric game such as this. That said, I'm kind of surprised so many kingdoms are music-free experiences. I would've expected those without backing tunes to be few and far between, but at the moment it seems like every other locale lacks a soundtrack. Still, I'd say the silence is better than the incessant "wah wah" effects that fill the levels of many other recent Mario titles. 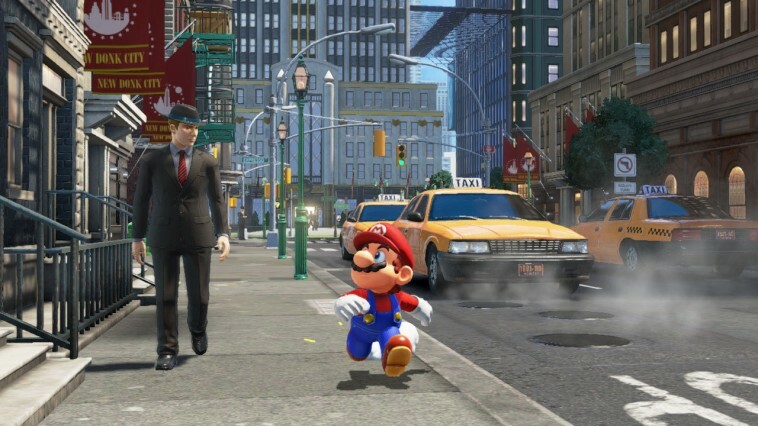 Have you spent any time with Super Mario Odyssey? If so, what do you think of the opinions I've spouted off here? Share your own in the comments section below.